For nearly a decade, it was as close as an independent company can become to being synonymous with a Magic format. One of the pioneers of the online store/strategy content hybrid model, StarCityGames hired Type 1/Vintage writers for its burgeoning stable of content creation almost as soon as the website launched in 2000. In short order, the website became a reader’s digest for Type I deck ideas and advice. Although the first regular Type 1 columnist was Virginia local Darren Di Battista, a very talented writer and Keeper expert, Oscar Tan anchored the StarCityGames (SCG) website’s Vintage content for five years. With trademark wit, Oscar connected with Vintage players and pros, shared decks, strategy advice, and play-by-play action with a dash of fantasy flavor to a wide audience. In time, a growing chorus of voices created strategy content for SCG, including JP Meyer, Philip Stanton, Carl Winter, Andy Probasco, and myself, among many others who occasionally published pieces worthy of broader view. Not content to simply support Type I ideas, in surprisingly quick fashion, SCG launched what would become the format’s largest and most important circuit for high level Type I and Vintage game play. For nearly five years, from July 2004 until the final event in May 2008, the SCG Power Nine series defined the Vintage format for a global audience, provided a space for players to unleash new strategies, build reputations, and brought Vintage players together in ways unlike anything else seen before or after. As part of my Schools of Magic: History of Vintage series, this special article will examine the origins, highlights, lowlights, and legacy of this infamous series, and the indelible mark it left on the Vintage format, even to this day. The StarCityGames tournament series lured hundreds of players in to the Vintage format, spurred the creation of unforgettable decks and left a remarkable record of Vintage play and achievement that inspires us to this day. Roanoke, Virginia is a city of just under a hundred thousand people. 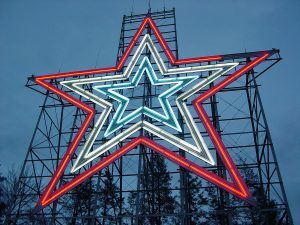 Known as the “Star City” for a famous, oversized ornamental star that sits in the mountains overlooking the city, entrepreneur Pete Hoefling opened an eponymous small comic book store in 1995. But his timing was not great. The comic book industry boomed in the early 1990s, but the market collapsed not long before he opened his store. In 1993, Magic: The Gathering inaugurated the collectible card game market, and not long in to his business Pete began selling Magic. Although Magic also seemed like it might be susceptible to the boom and bust cycle of other fads, it soon proved more enduring. The big turn for SCG was the emergence of the Internet as a retail outlet. Most major retailers at the time focused their business on brick and mortar operations. But perhaps in a Malcolm Gladwellian quirk of history, the disadvantage of his remote location may have spurred him to develop a greater advantage. Pete was a pioneer of using the Internet to build an online Magic store. The Internet was part and parcel of the emergence and development of Magic as a game. In some ways, Magic and the Internet were birthed together. Magic strategy content quickly developed in online forums and user groups, and hubs of content like The Dojo quickly emerged and built reputations. But few had successfully merged strategy and retail, especially at a national or global scale. Pete’s brilliant move, however, was to lure writing talent to his site by offering modest amounts of store credit. His business took off. SCG quickly gained a reputation for fast, reliable service in an industry dogged by shady dealers. A clean reputation and strong customer service combined with insightful content quickly made SCG a juggernaut in the industry. In short order it became the largest Magic retailer in the world. But SCG was more than a retailer. Pete flexed his muscles as a tournament organizer. Although there was a hub of Vintage play in the Northern Virginia region, SCG was too far away for that small community. Nonetheless, SCG was host to a range of Magic tournaments, including the Virginia States in 2002. At that event, SCG organized what would become one of the most significant regional Type I events at the time. With a Black Lotus and Mox Emerald guaranteed as prizes, the event drew a healthy crowd of nearly 30 players to compete in a Type I event, including the cream of the Type I crop, the regulars from Neutral Ground in New York City. Illustrating the extent of SCG ability to capitalize on its success for growth, the tournament winner Hill Redwine penned a report for the SCG website as well. Hill’s report was a virtual “who’s who” of known mid-Atlantic Type I players at the time. The importance of this initial event may be easily lost on modern players, but Type I, at least around this time, was viewed largely as a “dead” format. Since the schism that split Constructed Magic into Type I and Type II, Type I was largely phased out from competitive play. The last major Wizards sponsored Type I event was Pro Tour New York in late 1996. Aside from occasional play in the Magic Invitational, or by a small set of diehards at Origins and GenCon, Type I play was virtually non-existent as a paper format until around this time. Spurred by SCG content and small pockets of interest, the format began to sprout green shoots. These initiatives culminated in the nearly 200 player Type I Championship at GenCon in 2003. 1st: East Coast Vintage Championship Trophy and Unlimited Black Lotus! The event drew nearly 90 players and was a viewed as a success. Having tested the waters, SCG was ready to take the next big step. Vintage has come to be defined by great tournament series: the Vintage Championship, the Bazaar of Moxen, the Waterbury (aka TheManaDrain Open), the Italian Doomsday, the OvinoGeddeon, the Power Nine Challenges on MTGO, and, of course, the SCG Power Nine series. As noted before, by early 1997, Type I was essentially a defunct format. Devoid of tournaments and largely of interest, the only place Type I was played competitively regularly was at Origins, GenCon, and the Magic Invitational, which often featured a small Type I segment. Nonetheless, Inquest Magazine announced a major initiative that has now been virtually forgotten: a major Type I tournament series. Inquest announced 24 “open” tournaments across the United States with $1,000 in prizes, and then 8 “invitational” tournaments with $3,000 prizes, for people who Top 8’ed the Opens, or qualified based on rating. The series was a shot in the arm for Type I enthusiasts, but the series failed to build the momentum that its organizers had hoped for. 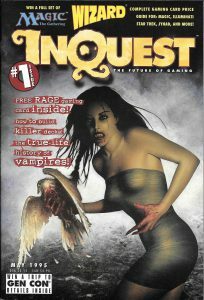 Inquest was a strategy magazine and price guide, but it was not an experienced organizer, nor a retailer. Nonetheless, for those who are curious enough, the Inquest series left a remarkable set of decklists, tournament reports, and insights into the 1997 Type I metagame (much of which I cover in my History of Vintage 1997 chapter). Fast forward to the summer of 2004, and Pete Hoefling made his biggest bet yet. With the success of Vintage side event at Grand Prix: DC behind him, Pete scheduled the inaugural StarCityGames Power Nine tournament in Virginia for July 18 2004. The tournament series earned its name with an astonishing prize purse – a copy of the full “Power Nine” awarded to the top 9 finishers, from Black Lotus through Timetwister. Although these prizes do not carry the monetary value they represent today, the total prize pool was nearly as attractive as anything found in competitive Magic, not including the Pro Tour. One hundred and sixty-seven souls made the trip to Virginia from parts all over for this inaugural event, making it one of the largest Type I events in recent memory. A smooth event and an epic feel created an impression of something momentous at work. Playing to its strengths as a strategy website, not simply a retailer or tournament organizer, Pete hired a top notch coverage team led by Ted Knutson that treated the event like a marquee tournament, with no less than twenty articles including match coverage, interviews, metagame breakdowns and analysis, and much more. The most recognizable and respected player in the Top 8 was probably Marc Perez, a Northern Virginia realtor who had gradually pushed Vintage in to new directions with his innovative UR Fish decks. Marc was one of the first players in the format to recognize and leverage the power of Null Rod with consistently successful results, having just won the Grand Prix: DC Vintage side event. His Top 8 performance marked a continuation of his remarkable run of success. But the winner of the event was Harvard student and HIV researcher Mike Panas, who played one of the format’s most beloved archetypes: Keeper. A 4-color control deck, Keeper was among the most popular strategies of the early 2000s, and was a direct descendant of Brian Weissman’s The Deck. More significant for the direction of the format was Eric Miller’s second place Workshop deck. For the past few years, Mishra’s Workshop strategies had gradually emerged as a force in the Type I metagame. Although Workshop decks had seen play on the Type I portion of the Magic Invitational, it was not until Goblin Welder was used in Workshop decks that decks like Stax and TNT (Tools N Tubbies) began to appear in tournament Top 8s as well. The printing of Trinisphere earlier in the year, and Crucible a few months before, began to gradually transform the Workshop archetype. The key lock parts in prevailing Workshop decks were Smokestack, Tangle Wire, and Sphere of Resistance, reinforced with Goblin Welder. Trinisphere and Crucible of Worlds fundamentally altered the evolution of the Workshop archetype. Although most players were still working under the Workshop Control paradigm represented by Smokestack, Eric Miller was one of the first to pioneer an approach that was fitted more in an aggressive direction, and certainly the first high performing and notable player to fit together the new trifecta of Trinisphere, Crucible, and Juggernaut. Accordingly, Eric smashed through most of the competition, losing only in the finals to Mike Panas. The key insight, which Eric either stumbled into or intentionally exploited, was the sequencing of Trinisphere with Juggernaut. While most Workshop players were content to cast Smokestack after Trinisphere, Eric recognized that he could win more games by simply going on offense. Trinisphere may be one of the best lock pieces ever printed, but it’s also an absurd tempo generator. First turn Trinisphere, second turn Juggernaut, and third turn Crucible + Wasteland is a virtually unbeatable sequence for the metagame he encountered, as long as the Trinisphere resolves. At the same time, any two of these elements worked together nearly as effectively. Eric proudly burnished singletons to be tutored up for flexibility, but the truth is that his deck drew most of its power from the three key elements just mentioned. A successful start, SCG had reason to believe that the series could grow over time as players invested their time and money in the format. In short order, Pete announced two more events, the next to be held at the end of October in Richmond again, and another in Chicago a few weeks later, with the 2004 Vintage Championship in between. The SCG Power Nine series quickly became a showcase for innovation for the newly christened “Vintage” format (formerly known as Type 1), and not just a reflection of a pre-existing metagame. Nowhere was this more evident than the next two events in the series in Richmond and Chicago. The return to Richmond was not long after Champions of Kamigawa was released. 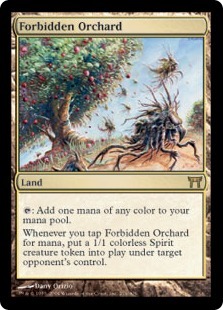 Although Kamigawa introduced many playable cards for Vintage play, the card that was best positioned for attacking the extant metagame was Forbidden Orchard. With Workshop Aggro, Fish, and Control Slaver decks with 4 Goblin Welder dominating the top tables of the Vintage Championship in August, it stood to reason that Oath of Druids was a well-positioned strategic trump, and Forbidden Orchard dramatically powered up the archetype. That’s exactly the conclusion I came to in the weeks leading up this event, and after intensive testing, I armed my entire team with our “MeanDeck Oath” list for this event (the only other Orchard-Oath pilot in the room was Aaron Forsythe, playing a more combo-oriented Oath deck while also checking out the Vintage metagame). Our deck dominated the field of 80 players, putting me and three teammates in the Top 8. I drew into the Top 8 and defeated teammate Jacob Orlove in the quarterfinals, but scooped to him to do coverage. A few other teammates ran in to each other in the final rounds, leaving a few more teammates just outside of the Top 8. Our dominance in this event inaugurated a new era in which teams designed and sprung new “tech” unto an unsuspecting metagame. This Oath deck was designed to be extremely controlling (and resilient), but also feature the fastest possible kill with an early Orchard+Oath (18 points in 2 turns!). The sideboard “Angel plan” provided additional resilience against faster strategies. Held November 6 2004, 140 players traveled to the Midwest to compete in the third SCG P9 event for the year. This time, Workshop Aggro won the event, but the breakout deck of the tournament was my 4th place Doomsday deck, which was undefeated in the Swiss. Although there were no intervening printings to abuse in the card pool, in September the DCI decided to unrestrict four cards, including Doomsday. Discovered and leaked weeks before this, I spent most of my time before this event tuning and preparing the best possible shell to abuse the brilliant combo. The combo was simple: cast Doomsday, draw Ancestral Recall, and cast it to play Dark Ritual, Black Lotus, and Mind’s Desire, flipping Beacon of Destruction four times in a row. Because of how easily disrupted the combo is once Doomsday is cast, I had to build a deck with maximum protection, including Force of Will, Unmask, and Duress. I had the great advantage of taking a room by surprise, since few players knew or understood what I was doing. Sadly, a critical misplay in the Top 4 cost me a chance at the finals, but this was the first notable Vintage tournament with Doomsday in a Top 8. On December 3, Pete Hoefling gave the Vintage community an early Christmas gift. More than simply announcing the next event in this already fabled series, Pete revealed that the Power Nine series would scale up to nine separate events in 2005 in three different cities, cycling through key regional Vintage hubs, the Northeast, the Midwest, and back to Virginia. Held just one week after a record breaking Waterbury tournament in Connecticut, the January Power Nine event in Richmond (SCG IV) was a disappointment, as only 58 players showed up for a shot a Power Nine, giving anyone in attendance pretty good odds at walking away with a piece of Power. Making his third SCG Power Nine event Top 8 in a row (having not attended SCG: Chicago), Eric Miller finally won an event with Workshop Aggro, but this time with a twist. Although jokes were leveled about Hanna’s Custody, it was a fairly effective anti-Control Slaver tactic. In truth, the power of cards like Trinisphere was such that most of the peripheral cards were largely irrelevant. Despite the small turnout, SCG pulled out all of the stops with an impressive team of coverage reporters and daily updates. Attendance dramatically improved when the series headed north to upstate New York at the end of February. 136 players showed up in Syracuse, including a few cars of Canadians, for SCG P9 5. 2003 Type I champion Carl Winter, Type I innovator JP Meyer, and SCG editor Ted Knutson did an incredible job on the coverage team, leaving a remarkable archive of insights and analysis. Kevin capped off what was one of the most impressive finals performances on the series yet, which included a game ending Balance and Yawgmoth’s Will, after having his board blown up by Nevinyrral’s Disk multiple times, to achieve a well-earned victory. Recognizing the weakness of Trinisphere toward Thirst for Knowledge and Rack and Ruin, Kevin attacked Control Slaver with Sphere of Resistance and Chains of Mephistopheles, without entirely abandoning the core combos of Trinisphere, Crucible, and Smokestack. Pete must have been pleased when the series returned to Chicago in April, because for the first time ever, the second event in a city had better attendance than the first. One hundred and fifty-four players made the trip to Chicago for SCG P9 6, making this not only larger than SCG P9 3 the previous October, but the second largest Power Nine event thus far. The home audience was rewarded with new technology and exciting developments in the metagame because SCG introduced some entirely novel coverage elements. For the first time ever, and partly to showcase the new SCG database, not only did the coverage team conduct a complete metagame breakdown (as had happened for SCG 1, 4, and 5), but they went much further. They did a complete card-by-card breakdown of every card in the room, and a matchup analysis that showed win percentages against every other archetype on the day, and overall match win percentage. Gifts Ungiven was another one of the intriguing printings from Champions of Kamigawa, but it took players much longer to figure out how to abuse it. Andy Probasco, borrowing some ideas from a few Germans, tuned a deck that could play multiple roles while finishing the game with a brutal combo. Gifts Ungiven was used to find Tinker, Mana Severance, Recoup, and Yawgmoth’s Will. Provided you had enough mana, you could easily win no matter what your opponent selected for you. Ben’s victory helped elevate Gifts Ungiven from a curiosity to a real Vintage threat, and this was the first Gifts deck to win a Power Nine tournament. The SCG P9 series was not simply a playground for long-time Vintage players. It was also a proving ground for new players. One of the breakout stars of the SCG circuit was Robert Vroman, a St. Louis native who made the trek to Chicago and Top 8’ed the event with a signature and ingenious Workshop deck. Vroman, as he simply came to be known, had identified little-played synergies to incredible effect. 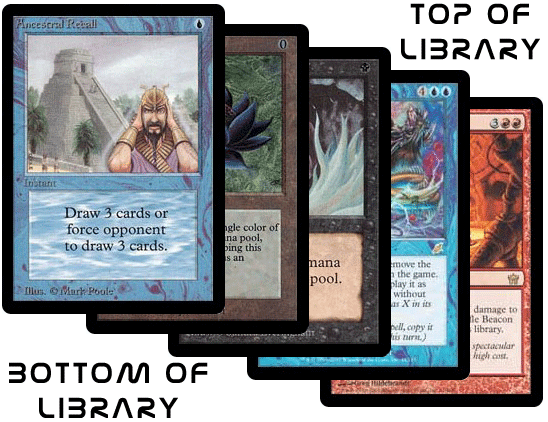 The restriction of Trinisphere, paradoxically, opened the door for new Workshop decks to step onto the stage, and Vroman’s abuse of the Uba Mask and Bazaar of Bagdad synergy stands as one of the best historical examples of how creative players can break through metagames with ingenious ideas. Bazaar and Welder are a threatening combo, as any stray Mox can become the most powerful artifact in the game. But when you place that package with Uba Mask, you have another lock piece that grafts perfectly in to a terrifying prison strategy. The 4th Power Nine event in 2005, and the 7th in the series, was held in Richmond again. Almost doubling attendance in January, and an improvement over the previous October, 110 players showed up in May for a chance at Power Nine. Once again confounding prognosticators, a Food Chain Goblins deck ran through a Workshop-heavy Top 8 to win the event. SCG P9 8 in Rochester, New York, would prove to be more than simply the next stop in the series. SCG had something special cooked up for this event. Held in the middle of June, this event was billed as “Shooting Stars.” The brainchild of Ted Knutson, the idea was simple: invite a suite of professional Magic players to Syracuse to compete with the masses, but with additional incentives and ideas. Every “Shooting Star” was given three special t-shirts, and was instructed to give one away for each loss they incurred to their opponent, thus inviting players to aim at them for a chance to take one away. This proved to be a brilliant idea, as 173 players ended up playing in this event, making it the largest Power Nine event in the entire run of the series. To match the hype, the coverage team did another outstanding job. Perhaps most importantly, however, this marks the first event in the series in which SCG published every single decklist in the event, including their final standings. The winner was Canadian Ugo Rivard with his trademark Control Slaver deck, marking the first SCG P9 event won by Control Slaver, but far from the last. The ninth event in the series was a return to Chicago at the end of July, the third such stop in Chicago. Although there was a slight downturn in attendance at137 players, Vroman improved upon his previous performance by winning the entire tournament with a refined version of his deck of the UbaStax deck. Notably, Roland Chang also made his second SCG P9 Top 8 here, finishing third, with a more traditional 5C Stax build, and would serve as a precursor to him winning the Vintage Championship less than a month later at GenCon. The third and final Power Nine stop in Richmond for the year was held at the end of September. Following a successful event at the beginning of the summer, this fall return to Richmond was even more disappointing than the January event, with only 55 players in attendance. Although SCG had abandoned the full coverage team, they more than compensated with it by, for the second time, publishing all 55 decklists in final standings. The top three finishers in this event were Gifts decks in the mold of Andy and Ben’s deck from earlier in the year. The second to last event of the year, the third and final SCG Chicago event of the year, and the 11th event in the series, was won, yet again, by Robert Vroman playing UbaStax. Vroman not only Top 8’ed three SCG Chicago stops in a row, but he won two of them consecutively, adding to his legend. This series also propelled Vroman into a Top 8 finish at the Vintage Championship at GenCon in August. Earlier in the year, Wizards announced that they would be allowing Starter 1999 and the three Portal introductory sets in to the Vintage format. This change would become effective October 20 2005. 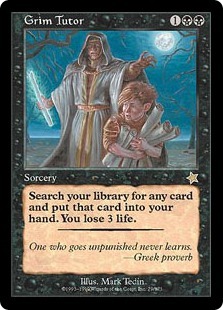 Grim Tutor, from Starter 1999, provided a superior tutor for the Long combo deck, as an upgrade to Death Wish, and one that I quickly assimilated in to a fierce competitor I dubbed “Grim Long,” and earned a 4th place finish. The lowest attended SCG P9 event in Chicago, 112 players showed up to compete for Power. Once again, SCG published all 112 decklists for posterity (the third time they did this in the series). The final Power Nine event of the year was slated for Rochester, the third event in upstate New York, and the 12th in the entire series. Although only 108 players came, less than the previous two stops in New York, it was still a good showing. But just as Vroman dominated the Chicago stop in the series, Ugo Rivard demonstrated a command of the Northeastern scene, winning the second event in Rochester in a row with Control Slaver, again. Tripling from 3 events to 9 in one year was a tremendous achievement of organization and logistics. In spite of everything, the events were a success. In 2006, SCG would hold 10 Power Nine tournaments in 5 events across 5 different cities. But the most important change was that SCG changed the format. Instead simply offering a single Power Nine tournament, each event was now a double-header, with a Day 1 and Day 2 tournament, each awarding Power Nine. This was a tremendous boon for players, who could now look forward to twice as much Vintage action, and more incentive to travel to events. With more than a little suspense, the first SCG P9 event of the year was scheduled for mid-March in Richmond. Hoping to avoid bad winter weather that kept so many players at home in 2005, the gambit worked, and 148 players rolled into town for Day 1 of SCG Richmond, the 13th event in the series. To sweeten the pot, just as Aaron Forsythe had traveled to SCG 2 in 2004, Randy Buehler, the head of Wizards R&D, announced that he’d be attending this event, and, what’s more, that he’d be Top 8ing it as well. The first, second, and third place decks were all Control Slaver, with Rich Shay (his first SCG P9 Top 8) taking down the tournament, while Brian DeMars got his third Top 8 in the series. Control Slaver dominated the Top 8, but the buzz of the tournament was the MeanDeck tech. My team, with Randy Buehler in tow, however, fielded something incredibly unique. A few months earlier, John ‘Friggin’ Rizzo had popularized a strategy in Extended that began to dominate the format using an overlooked mechanic in Ravnica, Dredge. In our laboratory, our team was quietly working on the best version of the “Friggorid” deck, and I came up with a brew that I thought was incredible. As a result, I hold the honor of being the first person to Top 8 a major Vintage event with a Dredge deck (my 4th Top 8 in the SCG P9 series). The deck was capable of winning games without playing a single spell. But even then, the format was too fast to expect to be able to win undisrupted, so I included cards like Chalice and Leyline of the Void for additional disruption. My Top 8 performance with the deck proved it was a viable strategy, but no one could have known where this strategy would eventually head. A sizable 119 players stayed around for Day 2, but another Control Slaver player won the tournament, this time Brian Fischer. It was notable, however, that three players managed to Top 8 the event both days: Eric Becker, Colby Evenpence, and me (although I was the only one to play two different decks – Day 2 I played Grim Long, and knocked Rich Shay out of the tournament with a pair of Turn 1 kills). The second SCG Power Nine event of the year, the 15th and 16th Power Nine tournaments, were held in Rochester, New York June 11-12 2006. The previous three upstate New York Power Nine events had each cracked 100 players, with the Shooting event a year before drawing a record for the entire series. Although less than the organizers hoped for, 112 players arrived in Rochester in the middle of June to compete for Power, the third largest New York entry in the series. The resulting Day 1 Top 8 signaled a dramatic shift in the metagame, both from the events in April as well as the previous events in New York. The resulting Top 8 was half combo decks, split between Grim Long and Worldgorger Dragon combo, two strategies with a track record of success against Control Slaver, which had proven itself as the deck to beat. Jimmy McCarthy, a Midwestern player, carved through the Top 8 until the finals, where he met his match in what would become a breakout tournament for a new Vintage star and fellow Midwesterner, Tommy Kolowith. Tommy played what he dubbed “The Sullivan Solution,” a blue-black aggro control deck anchored by Dark Confidant, and whose name referred to Adrian Sullivan, another Wisconsonite. For a Top 8 infested with various strains of combo, the mixture and density of hyper-efficient countermagic, discard, and spell disruption proved lethal. Erayo was a nightmare for any speed combo deck, and Duress and Stifle were live from turn 1. Even the singleton Shadow of Doubt was a play that could prove fatal. Day 2 drew 96 returning players, slightly more than 85% of the Day 1 crowd, a retention figure signaling the appeal of the double Power Nine concept. Ugo Rivard slipped in to the Top 8 with Control Slaver, for the third time, but failed to clinch the brass ring. Peter Olszewski Top 8’ed both days with Worldgorger Dragon combo, the only player to do so at this stop in the series. This was his fourth SCG Power Nine Top 8. On the other hand, I also finished 4th place with Grim Long, my sixth Top 8 in the series. The winner, however, was another Midwesterner, and a teammate of Tommy Kolowith, Jeremy Seroogy playing 5C Stax. The field was a mixture of favorites and experimental and oddball strategies that seem only possible in the Vintage format. The SCG Power Nine series found new host cities in 2006. With successful events in Richmond and Rochester, two familiar stops, the third event of the year was slated for Charlotte, North Carolina. A city that enjoyed major growth in the early 21st century, this was also the southernmost stop in the series. Given that Vintage hubs had been established in the DC corridor, the Northeast, and the Midwest, one had reason to doubt whether there were enough locals to support an event with a prize pool this valuable, and even more serious doubts about whether groups would make the trek in early July, just a few weeks after a successful event in New York, and just two days before a national holiday. These fears were realized when only 49 players showed up in Charlotte on July 2nd to compete in the 17th SCG Power Nine tournament, the worst turnout in the series history thus far. SCG must have suffered massive losses on this event, but it is a credit to their brand that they gave away everything as advertised. Despite the disappointing turnout, the event would prove, once again, foreshadowing for the Vintage Championship. Nate Pease won the event piloting MeanDeck Gifts, a Gifts Ungiven strategy that eschewed the traditional Thirst for Knowledge draw engine and the various odd-ball combos like Goblin Charbelcher and Mana Severance, or Time Vault and Flame Fusillade, for a far more focused set of strategic objectives and a specific emphasis on Merchant Scroll. A more faithful version of MeanDeck Gifts would win the Vintage Championship a month and a half later (Nate shaved the 4th Merchant Scroll and 3rd Misdirection off for a Lava Dart and Skeletal Scrying). Although Nate was able to Top 8 Day 2 of SCG Charlotte (the only player to Top 8 both days), he was unable to win that event as well. Eric finished in 10th place with this deck on Day 1, but managed to break into the Top 8 on Day 2, his third Top 8 in the series. The changes from Grim Long were pretty simple: remove 4 Duress, Wheel of Fortune, Regrowth, and Xantid Swarm (in other words, the red and green cards), and add 4 Force of Wills and 3 Misdirections. Then trim Elvish Spirit Guides and add another pair of Cabal Rituals, and then swap out rainbow lands for dual lands, fetchlands, and basics. And voila, Pitch Long. This would become one of the best decks of the year, if not in the history of the format. And, in the hands of Tommy Kolowith, it would finish 2nd in the Vintage Championship a month and a half later. Waiting until after the Vintage Championship in GenCon was in the rear view mirror, SCG scheduled the 4th SCG Power Nine double header of the year in Boston, Massachusetts for the weekend of September 17-18. While many projected one of the largest SCG events in the series, an ultimately disappointing turn out of only 117 players showed up for Day 1. In a loaded field, the Top 8 featured several players who had won Power on the series before, including Nate Pease and Tommy Kolowith, but the winner was Jeff Greene playing an innovative 5C Uba Stax list. Day 2 of SCG Boston was the 20th Power Nine tournament in the series, but an even more disappointing turn out of only 77 players must have had organizers scratching their heads. The finals was a mirror image of the Vintage Championship, with Mike Pise playing Gifts, defeating Mike Herbig playing Pitch Long. The final SCG Power Nine event of 2006 was held mid-November in Roanoke, the home base for SCG. Although SCG had hosted many Power Nine events in Richmond, this was the first event to be held in the new Gamestore Super Center. This undoubtedly made running the tournament easier for SCG, since they did not have to find another host or co-organizer, but it nonetheless proved a drag on attendance. Only 47 players showed up Day 1, the worst attended event in the entire series thus far, and only 43 showed up in Day 2, the ultimate nadir for this enterprise. Nonetheless, the small crowd belied the intensity of competition, as carloads of ringers found their way to the Star City. In a reversal of the pattern, Pitch Long in the hands of Jeff Folinus defeated Michael Heatherington playing MeanDeck Gifts in the finals of SCG Roanoke Day 1, the 21st SCG Power Nine tournament. A trio of Fish decks made Top 8, including Eric Becker playing “Urbana” Fish in 3rd place, and Dave Feinstein, a Northeastern tournament organizer playing U/W Fish in 6th, who also Top 8’ed in Boston. In Day 2, both Dave and Michael Top 8’ed again, making it three consecutive Top 8s in the series (since they both Top 8’ed Day 2 of SCG Boston), a rare streak in the series. Cody Vinci won his first SCG Power Nine event with what he called “Drain Tendrils” over the Day 2 field. Paul Mastriano ended up in 6th place with Pitch Long, his first SCG Power Nine Top 8 after a Top 8 appearance in the 2006 Vintage Championship Top 8. Scaling up from 4 major Vintage events in 2004, including 3 Power Nine events, to 9 in 2005, and 10 tournaments in 2006 was a feat of logistical mastery and organizing prowess. It was time for SCG, as a company, to take stock of the endeavor. The series had started off promising, with 167 players in Richmond, but the series only managed to surpass that total one more time, in a specially billed “Shooting Stars” event. Nonetheless, 7 of the 9 tournaments in 2005 cracked 100, and the Chicago and New York tournaments were healthy 8 round events, on average. 2006 started off strong, with a large return in Richmond, in what would prove to be the largest event of the year. Although the Charlotte event was predictably disappointing, the bigger disappointments must have been attendance in Boston and Rochester, which failed to rise to previous attendance levels despite the additional incentive of a Day 2 tournament. The disappointment arose not simply from the objective attendance levels, but from the fact that the series appeared to be plateauing, and failing to build momentum or grow. The core problem, however, was that the series was a victim of its own success. When the series began in 2004, the price of Power was valuable, but within reach. Moxen ranged from 300-550 hundred dollars a pop, and a Black Lotus was around $600. By 2007, those prices had doubled. Although the popularity Vintage generally was a big driver, it was actually the SCG series itself that probably was the most important driver. The greatest appreciation in the price of Power occurred during this series. But attendance had not increased with prices, leaving a larger and larger deficit in the SCG register for these events as time went on. At the same time, outside of Virginia, SCG needed a reliable and effective host. That increased costs while reducing control over ancillary revenues. Moving the last SCG event to home base improved ancillary revenues, such as dealing profits, but predictably reduced attendance. After a six month hiatus SCG scheduled the next Power Nine stop for Roanoke in June 2007. No longer a double-header event, this would be the 23rd Power Nine event in the series. 60 players would make the trek to compete in what was unexpectedly a lame duck format, since the DCI announced sweeping changes to the Vintage format at the beginning of the month, including the restriction of Gifts and the unrestriction of Gush. It would prove a milestone event marking the end of one iteration of the Vintage format, and multiple groups came the same conclusion. A fitting conclusion to a remarkable era, the changes to the Banned and Restricted List would bring the Gifts and Pitch Long period to a close. 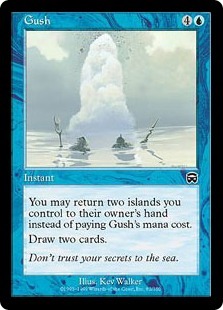 The unrestriction of Gush, brought new energy to the Vintage format. The Vintage Championship at GenCon in August featured a pair of Gush decks in the finals (myself and Rich Shay), and SCG wisely scheduled its next event in the aftermath, in the same city of Indianapolis. The community chatter after this event was intense, with some players decrying the dominance of Gush, and others more intently focused on the diversity of Gush decks and the player skill rewarded by the format. There was no denying that it was interesting, even if a polarizing result. What a way to close out the year. Although SCG had little reason to be unhappy with the Indianapolis and Chicago tournament attendance, the event size was still not what was really needed to offset the continually escalating price of the prize pool. With 25 tournaments in the series so far, it was difficult to understand what mixture of factors would draw more players. In general, the Midwest and Northeast events consistently broke 100 players. In addition, events in the middle 6 months of the year seemed to do better than those in the winter and around holidays. And new formats seemed to draw more players than formats without Banned and Restricted List changes. The last SCG Power Nine event in the series would be a double header, and bring the series full circle. The 26th and 27th Power Nine tournaments, were held May 11th and 12th 2008 in Richmond, Virginia, where the series began. 83 players showed up for battle on Day 1. The resulting Top 8 was one for the ages. The Top 8 was full of various Gush decks, including the so-called “Tyrant Oath” deck, a Dredge deck, and a Flash combo deck. But the winner was the always innovative Andy “Brassman” Probasco making his 5th Power Nine Top 8 playing a Painter Control deck, hot off the heels of Shadowmoor, where Painter’s Servant was printed. 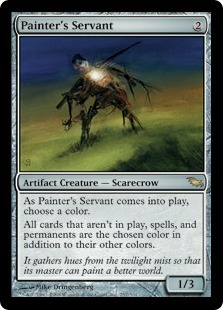 Painter’s Servant turned every card blue in every game zone, including cards in hand and in a player’s deck. If Grindstone was activated, it would see each flip as being a colored card of the named color, they would match, and Grindstone would continue to mill the deck until the opponent had no deck left to draw from. 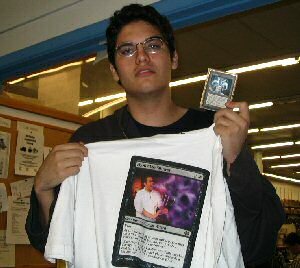 Although it is impossible to tell precisely, the roughly dozen events where SCG published every decklist suggest that Andy Probasco may be the greatest “road warrior of the series.” In addition to his 5 Top 8s, Andy finished 34th in Charlotte, 25th and 106th in Rochester, 92nd and 110th in Richmond, 23rd in Rochester, 105th in Chicago, did coverage at the Shooting Stars event, 10th place at SCG 7 in Richmond, and finished outside of the Top 8 in the very last event, Day 2 of Richmond 2007. In other words, Andy attended at least 15 of the 27 events, probably the record. Day 2 of SCG Richmond would prove to be a fitting epitaph to a series that shaped the Vintage metagame so profoundly. As the DCI would announce the restriction of Gush, Brainstorm, Merchant Scroll, Ponder, and Flash on June 1st, this would be the last major Vintage tournament of that Gush era. The victor was Brian DeMars, but Gush was the real winner. The resulting Top 8, which had every single major Gush deck of the era in it, including Tyrant Oath, Painter, GroAtog, and Gush Storm, was a perfect finale. Rounding out the Top 8 was a Dredge deck, and Nick Coss on Hulk Flash. With just 60 participants on Day 2, the event was clearly a monetary loss for the host, but not enough to make Pete or SCG call it a day. Instead, Pete expressed every interest in continuing the series, provided a location and date could be found that could avoid a loss. Unfortunately, that never happened. Instead, and understandably, SCG turned its sights to other formats, and started a Legacy and Standard “5K” series that was modeled after the Power Nine series. Saturday would be a large Standard tournament, and Sunday would be a large Legacy tournament, at each and every stop. This proved to be much more successful, and in a few years morphed in to the popular SCG tournament circuit that now travels across the country. In other words, the Power Nine series was a precursor to the largest privately run Magic tournament circuit that exists. It may be difficult to appreciate today, but SCG is partly responsible for the revival of the the Type I/Vintage format, by throwing a life raft to a format that was largely defunct. By sponsoring strategy content and ultimately one of the format’s premier tournament circuits, it both nurtured and strengthened communities of interest. It created a metagame for an enigmatic format by regularly publishing decklists and providing professional level coverage and narratives. It was a proving ground for Vintage experts that can be found today, like myself, Andy Probasco, Brian DeMars, Robert Vroman, Roland Chang, and so many others. But it was also a place where players like Owen Turtenwald first made their name before turning Professional. Even to this day, it remains a remarkable archive of creativity and innovation as well as a snapshot of a historical metagame. I hope that players can find ideas and inspiration as well as understanding from this trove of data and decklists. In the final analysis, however, a Vintage series on the scope and scale of what SCG attempted was ultimately unsustainable. Not because of lack of player interest or organization or logistics. Rather, a series like this sows the seeds of its own demise. The interest generated in Vintage made the prize pool increasingly expensive by creating new demand for Vintage staples, which are in very limited supply, which in turn pushed costs much higher. As much as SCG may have wanted to continue the series, it was ultimately unfeasible as structured. I will close with an honor roll list of players that repeatedly Top 8’ed tournaments in the series. In 27 tournaments, there were 216 players who walked away with a piece of power, including 138 unique players in those Top 8s. That means that there were many players, as we’ve seen, who Top 8’ed multiple times. But who Top 8’ed the most? Of those 138 unique players, there were 11 players who Top 8’ed 4 or more tournaments. To learn more about the decks, strategies, players and stories behind these events, please be sure to check out the chapters in this History of Vintage series and peruse the links here with coverage, interviews, and more.